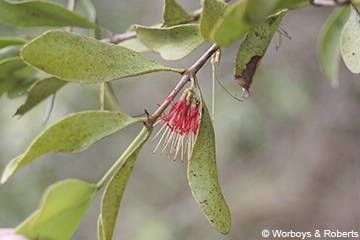 This mistletoe is found on a number of hosts. Epicortical runners are absent, leaves opposite elliptic to obovate to 8.5 long. Flowers are straight, petals 5 free from one another, green often with a pinkish or reddish tinge. Fruit berry-like to 7 mm long.